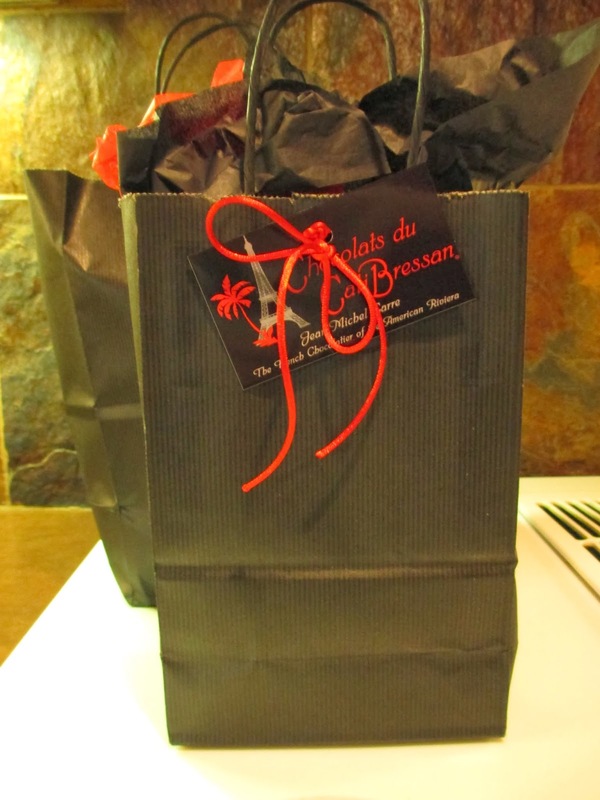 I may have gone a little overboard when I stumbled into Jean-Michel Carre's Santa Barbara location for Chocolats du Cali Bressan: I came out with a six piece box, two sample chocolates, a soap, and a candle. But it's exciting trying out a new chocolate company, and it's exciting stumbling unexpectedly on a chocolate shop (or candy shop, for that matter--I'll follow up eventually with my chocolate findings from a candy store in Ojai). As you start to see simply from the outside of the store, the primary colors of this company are black and red, which I find refreshing. It creates a new, romantic, and sophisticated look, completely apart from the more common whites and golds. And the location, with all its architectural details, definitely helps. Besides the regular merits of good customer service, the staff here are well-versed in the art of wrapping. They wrap things in tissue and ribbon and Cali Bressan stickers, all kept up in black gift bags. Interestingly, the bags are hole-punched so that business cards can be tied on; this means that the bags are easily reusable if you remove the business card. Reusing a gift bag isn't always so easy when a company adds their sticker onto the bag. Continuing the color scheme, my little box was black with a cheery red ribbon. The price was completely average for boxed chocolates. While you might think that I chose six flavors, I in fact only picked out two: the box was for sharing with two other people. So when confronted with an entire glass case of chocolates, how did I chose only two flavors? First, you know that I tend to like fish. 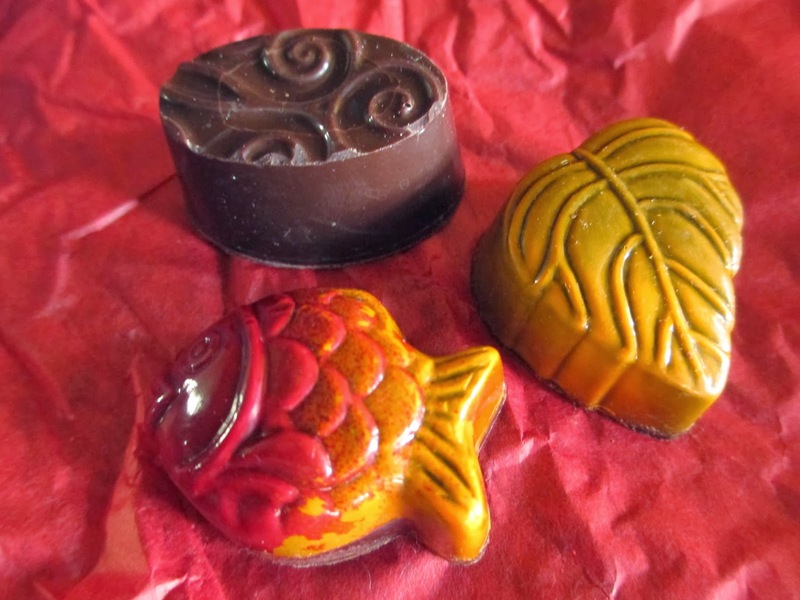 I've even had a chocolate salmon before (I mean, chocolate molded into a salmon shape, not salmon cooked with chocolate). So, naturally, I found the Fish adorable; the peanut butter flavor, also, seemed common enough that it would appeal to different people. One flavor, then I needed one plain chocolate. Given the wonderfulness of chocolate with a Madagascar origin, I went for the Madagascar. The third chocolate you see here is one of the samples, a salted caramel. The leaf is gorgeous, with the color painted on and the clear molding with the veins. It smells like fragrant chocolate. But when I bit in, I instantly found the shell a little too thick, especially on bottom. Probably the mold probably could be thinner. The caramel is just shy enough away from liquid that it doesn't spill out, but stays put inside the chocolate. It has a pretty standard sweet/salty taste, though the chocolate does add so much fragrance to the flavor; it certainly tastes like good quality. Is it floral or marshmallow? Maybe both. It's a nice chocolate, but a less thick shell would've really helped. The Madagascar is a plain oval with scroll pattern. The label says that the ganache, which is 67% cocoa, is from Madagascar, but not the shell. Hmm. But then comes the part where you taste and discover that, oh, wow, that is a good ganache. It's so creamy and so light, without a hint of graininess or heaviness to the texture. It's smooth and soft as butter; I'd imagine they used a lot of fresh cream. Yet it tastes as dense as a flourless chocolate cake--as mine, not a cheap restaurant one. Those Madagascar fruity notes come through on the waves of chocolate and cream (not really cream, but I picture it as such). Then you taste the plain dark chocolate, which brings all the clouds back down to earth. Heavenly and divine. I thought this one would have too thick of a shell, as well, but somehow it works because it seems like there's more filling and the filling does take a moment to melt, if only a short moment. Last comes the Fish, which has a dark chocolate ganache with old fashioned peanut butter in a dark chocolate shell. Red paints the head, with orange on the scales and fins. It's such a cute little guy, plus a safe flavor choice. Unfortunately, though, the bottom of some of these chocolates looks a little sloppy--is that just me thinking that? I know they're handmade and that imperfections simply add character. But still I wonder. Also look at the side of one of the fish; the paint looks smeary and doesn't go all the way down like it does on the others. 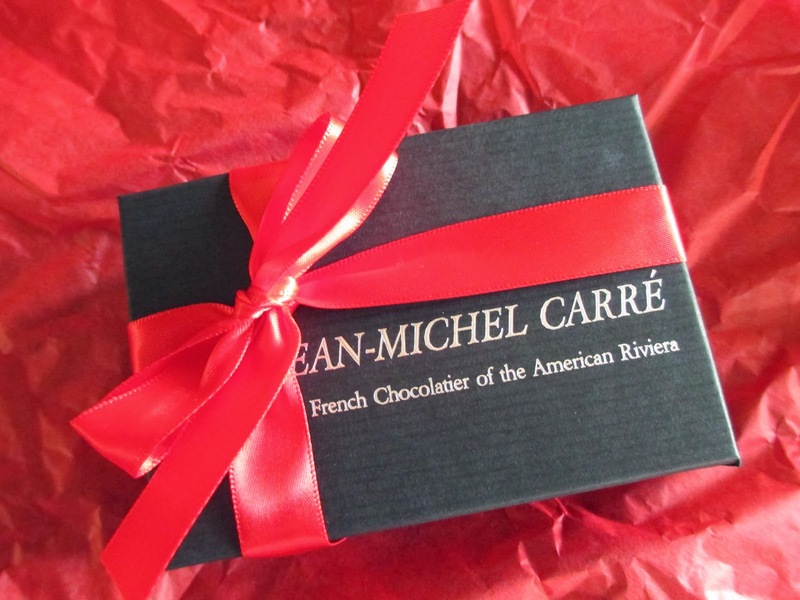 Is that really what I should expect from fine, handmade chocolates? It just looks so pretty sitting there, that it was a little disappointing to pick it up and find these imperfections. But let me move on to the flavor. Somehow, I didn't believe them that the peanut butter was in a ganache. And let me tell you, that was a good idea. It means that you get the peanut butter flavor we all love, but without the greasiness and oiliness of actual peanut butter. The peanut butter taste is still a tad buttery for me (you know I'm used to eating Trader Joe's peanut butter), but it does taste like real peanuts. This is also one of those few instances where you have peanut butter with dark chocolate. It works, probably because the peanut butter is infused into the rich ganache to start with; it's really a grown up version of peanut butter chocolate, the most sophisticated I have tasted. A very good job at creating a new take on an average flavor combo. I'd still like to see some adjusting on the shells, but overall I like these findings. The chocolates are beautiful. The Madagascar and the Fish were great. So I'm happy.